Shifts in how retailers and consumer packaged goods (CPG) brands think about ecommerce, combined with an accelerating acceptance among consumers for buying food digitally, have boosted online sales of groceries. Retailers and brands are taking note of these changing consumer behaviors and offering more digital options for grocery shopping and delivery, which will continue to drive the trend upward in 2017 and beyond. While the majority of grocery shopping is still conducted in-store, more consumers are testing and adopting ecommerce options for buying food. Digital grocery sales are expected to be the biggest driver of growth in the ecommerce sector as a whole over the next five years. Retail options for consumers are multiplying, as are choices for delivery, making it easier for shoppers to test and ultimately adopt online grocery shopping. Personalization strategies help to sort through the thousands of products available from online retailers, reducing the time it takes consumers to grocery shop—in turn generating repeat business. Smartphones and other connected devices are enabling “always-on” behavior among shoppers, who are compiling grocery lists using internet of things (IoT) technologies such as Amazon Echo. Brands are recognizing the need to take control in the ecommerce channel and are working with retailers to ensure their products appear in the digital aisle in such a way that shoppers will find them. Retailers and brands are taking note of how to create a frictionless online experience, from ordering to pickup or delivery. They have one chance to get it right: A bad experience with one retailer could turn a consumer off to online grocery shopping for good. 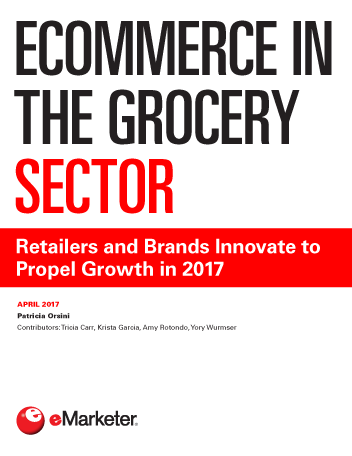 "Digital grocery sales are expected to hit $71 billion in 2017, a 34% increase from 2016."